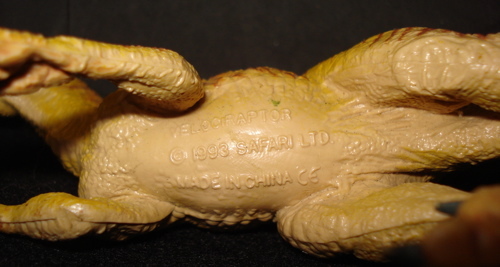 The 1993 Raptor Dinosaur from Safari Ltd.- a true standard. 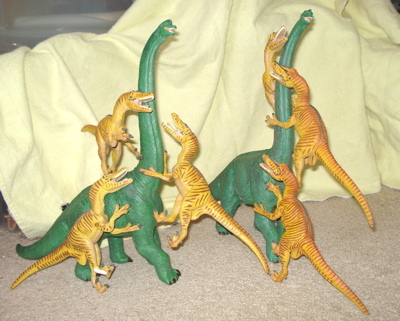 This is one of my absolutely favorite Dinosaur toys. It is beautifully sculpted (as you will see) with lots of expression and a very ferocious look along with excellent detail. Weighing-in at four and a half ounces (4.5 oz, 128 gms) and measuring thirteen inches (13", 33cms) it is approximately 1/6 scale. 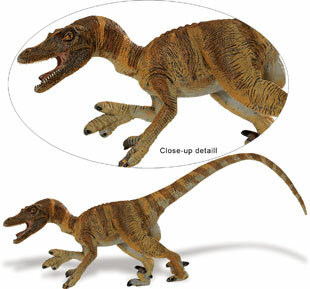 Real Velociraptors (opens a new window) were about seven feet in length and perhaps a foot and a half at the hip. NOT Dinosaur Huge. 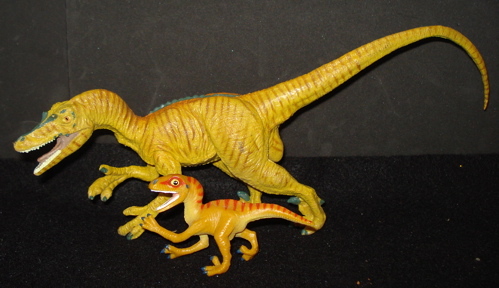 In the (Above) photo we see the Safari Raptor Dinosaur with a Carnegie Deinonychus in 1/40 scale. 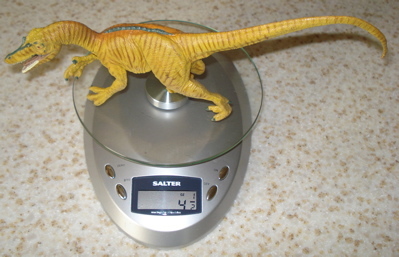 Given the norm of "museum quality" Dinosaur toys this would be more in line with scale. 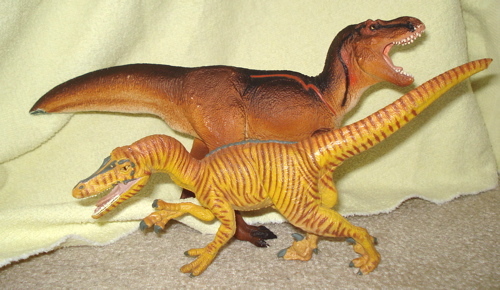 In fact, this Velociraptor is close in size to the average 'museum quality' Tyrannosaurus (Below- with Carnegie T-Rex). 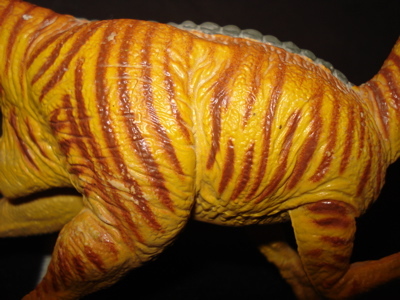 Safari has since done a repaint which looks even more vital and realistic (Left). The only thing that I do not like about this particular figure is the what I consider to be an overlong tail. In consequence I have "bobbed" the tails of most of mine as I am sure you will or already have notice(d). This has not affected their ability, agility or playability. Because they are individually hand-painted there are definite differences, one to the next, which are probably more easily seen in person than in pictures. The differences are in both depth of color and thickness of striping. I love my little digital camera but sometimes it just won't take the picture I see. skin folds (Above) and indentations for the rib cage to be seen in this marvelously dynamic figure. Even though I really, really like this color pattern I suspect that the latest version (see above) is even better. 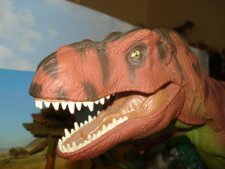 Given that there was a thirty-foot sized Raptor Dinosaur, the Utah Raptor, this figure being 'oversized' in a Dinosaur toys world he never made does not hurt him one bit. He's big enough to take care of himself. three claws to each hand. Despite the fact that this figure is in the 'dreaded three point stance' (two feet and front left paw) it is barely noticeable given the forward thrust of the figure. 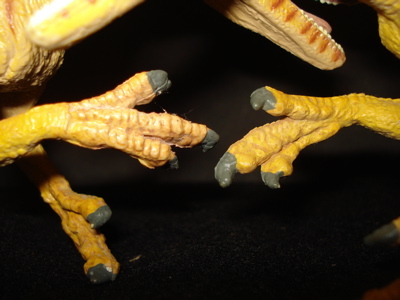 Equally bold are the extremely well done foot claws, (Right) displaying extraordinary detail in both the two 'walking' claws and the third disemboweling claw, the one that could slash forward and tear a gaping wound in an opponent or a soon to be luncheon guest. Once again, extraordinary work, even more so given the date of manufacture. "Waddya mean you don't carry any money because you don't have any pockets?" 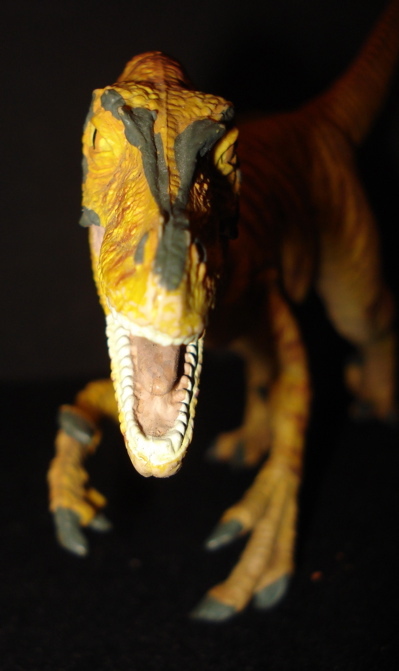 The detailing of the head of this Velociraptor is equally well done (you may have noticed that I really like this figure) and, somehow, each individual really seems to be able to have that very individual differentiated look. The teeth are individually sculpted in tight rows, the tongue is clearly differentiated and the palate clear, the only flaw is that they are all the same shade of pink (except for the teeth, which are white). The eyes are round, yellow, with an orange iris and black, vertical pupil. I have had most of mine for in excess of a decade and their paint jobs remain crisp and bright. They are showing very little of the expected wear. The base plastic (rubber?) is a light beige (discovered in the tail bobbing). A rather intimidating look, head-on, don't you think? "Let's shake and be friends. We may have the same tastes...."
The Starbean Iguanodon is one of my "designated victims" and here is another fine mess it's gotten itself into. dining pleasure and the dramatic presentation of this page. 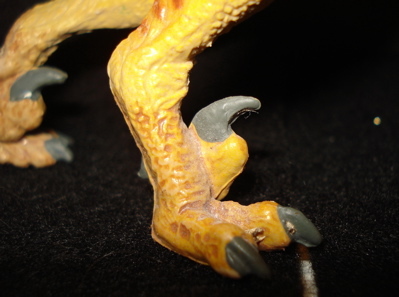 The underside, or belly of the Velociraptor has the manufacturer's name, date of manufacture and the name of the Raptor Dinosaur all clearly imprinted. Along with the European Union "CE"-safety designation indicating that it is safe to eat. And play with. In a perfunctory web search I have found these available online (though not many) for from $7.99 to $9.99. It appears that these may be being supplanted by the newer, 2007 sculpture in the Wild Safari lineup. It would be my strong recommendation that you pick one or two up if you haven't any already. 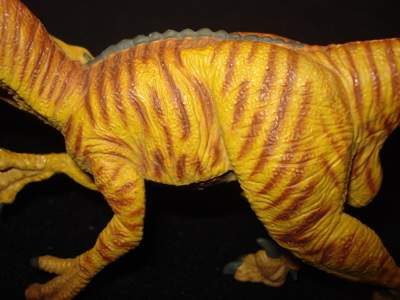 This Raptor Dinosaur is a classic figure and truly, beautifully achieved. 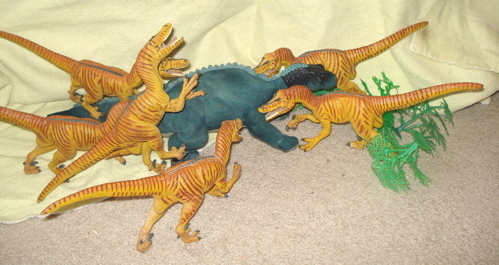 You may find it rather easily as part of a "lot" of Carnegie, Safari or just plain Dinosaurs on eBay. It is certainly collectable and may, in time become a collectible. If it doesn't it won't care because it will always be a great toy and being plastic means you never have to cry. 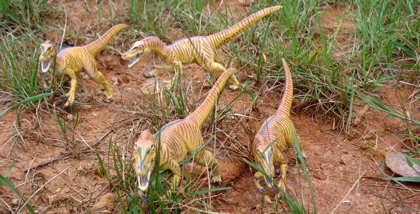 Coming out in 1993 it was a part of the Wild Safari "Dinosaurs of China" four figure series. 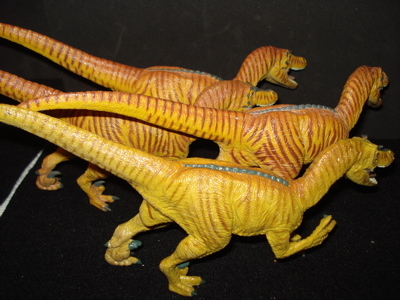 The other three (A Yangchuanosaurus- less said the better, a Therinzosaurus- interesting but looked like a clown and a Mamenchisaurus- a long necked Sauropod) are all, perhaps blessedly, out of production even while this Raptor Dinosaur got a repaint. Quality wins the day. As noted earlier it has the Euro-Union seal of safety so it can be safely chewed on but that would be a shameful mis-use of one of the best Dinosaur toys to come out of the last decade of the Twentieth Century. 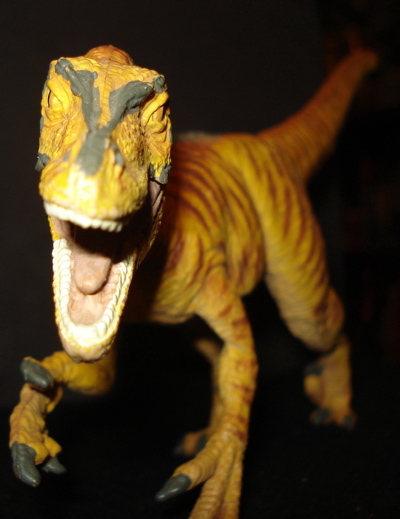 It is what might be considered a cross-over between the more toyish (though excellent) Dinosaur toys like the 1996 Safari Allosaurus and T-Rex. 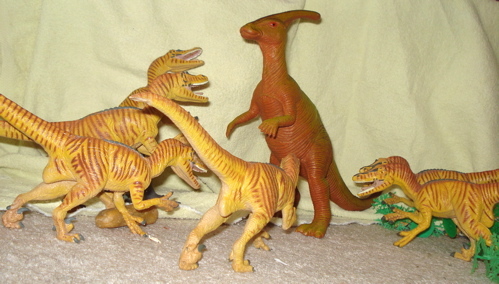 Of passing note is that Safari put out these latter toys after the Raptor Dinosaur. Perhaps they didn't want to compete with their own Carnegie Collection. Whatever the reason they are certainly competing with it, and more, now. 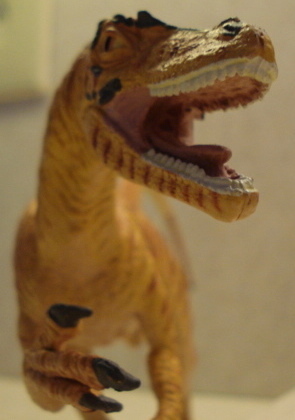 This Velociraptor has been worthy competition for any Toy Company's Dinosaur toys collection since it came out! 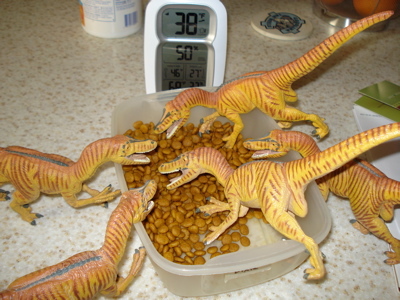 It's a bit chilly outside and breakfasting on a big bowl of Raptor-Kibble is a great way to start the day off right. Some might be a bit pushier than others but there is plenty for everyone. The first (black) box will let you search our site. 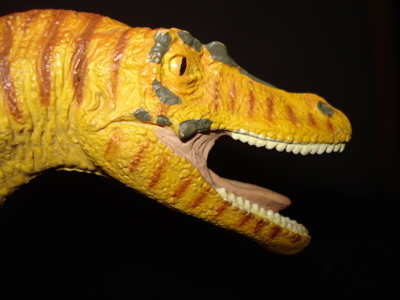 Find everything mentioned about, say, the Raptor Dinosaur or Diplodocus. The second (gray) search box will take you anywhere on the web you want to go. We thank you for coming to our 1993 Safari Velociraptor page. 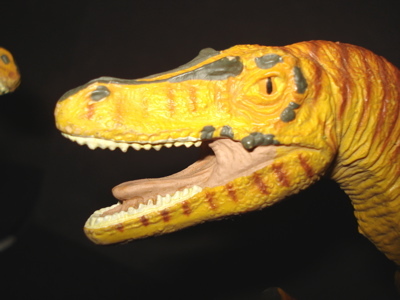 For more Raptor Dinosaur please use This Link to return to our main Velociraptor page.